Dubai, UAE, January 09, 2019: Cadillac has announced the arrival of the 2019 ATS Coupe in the Middle East. The ATS is one of the segment's most exhilarating and agile luxury cars. The ATS boasts the latest Cadillac user experience system to make it one of the most connected cars in its class. The system is redefined through innovative features such as Personalized Profiles, integrated smartphone-like navigation, increasing user connectivity and creating a more user-friendly system. Both the ATS Premium Luxury and Premium Performance coupe models are offered with Cadillac's award-winning 3.6L 335 hp V-6 engine. RWD is standard on the ATS model range. The ATS-V high-performance coupe takes performance to the next level, with a twin-turbocharged V6 engine and track-capable suspension. The performance platform is so effective, it is the foundation for other award-winning luxury performance Cadillacs – ATS-V Coupe, CTS, CTS V-Sport, CTS-V super sedan and the championship-winning ATS.V-R Coupe race car. 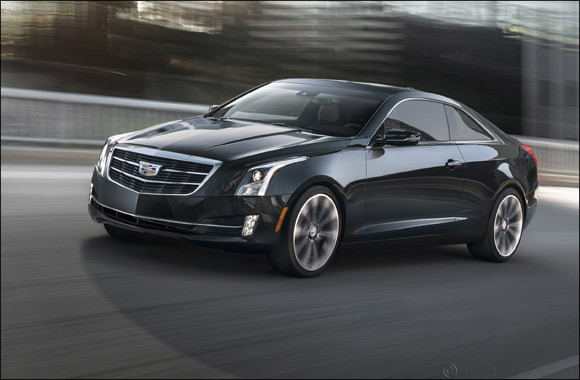 The Cadillac ATS Coupe is one of the most connected cars in its segment. The latest Cadillac User Experience (CUE) system with 8-inch-diagonal color touchscreen are standard. With functionality that applies popular apps and smartphone practices in the vehicle, the CUE system provides drivers with easier access to the most common features. The more intuitive operation includes a Summary View in which all key applications, including climate, audio, phone and navigation, are displayed on one screen. The 2019 Cadillac ATS Premium Luxury offers the award-winning 3.6L V-6 engine SAE-rated at 335. and an elevated driving experience with unique content, technology and interior and exterior appointments. Standard leather seating surfaces with heated, 8-way power front seats with lumbar support show off Cadillac's handcrafted cut-and-sew application. Programmable memory driver seat and mirror controls are at the fingertips of every ATS Premium Luxury Coupecustomer. Other standard connectivity and convenience technologies include Cadillac's Driver Awareness Package, Rear Vision Camera, 220-volt conventional power outlet and upgraded Bose Premium Surround system. The 2019 Cadillac ATS Premium Performance is powered by an award-winning 3.6L V-6 engine SAE-rated at 335 hp. The ATS Premium Performance includes luxury interior, exterior and technological appointments befitting the top of the ATS range. Additional race-inspired componentry and systems, including segment exclusive Magnetic Ride Control adaptive suspension, limited-slip rear differential, performance cooling and performance tires, distinguish the Cadillac ATS Premium Performance as the ATS of choice for those aspiring incredible performance without a V-Series badge. Available advanced safety technologies include active safety features to help protect occupants before, during and after a collision. A driver-focused interior with integrated technology and crafted materials complements the exterior elements and supports the Cadillac ATS's driving experience. A choice of real wood, metal plating and carbon fiber trim, and Cadillac's cut-and-sewn instrument panel, console and doors enhance the emotional connection to the ATS. Design and engineering philosophies distill all the engaging dynamic identities the for which the brand is renowned. The Cadillac ATS Coupe ride on a 2,775 mm wheelbase. The roof, doors, front and rear fenders and trunk lid are unique to each, along with specific front and rear fascias on the Coupe that accommodate a wide track.